Provide comfort for the family of Elaine Meyer with a meaningful gesture of sympathy. 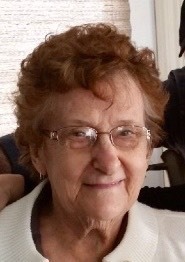 Elaine Patricia Meyer (nee McNab), of Walkerton, passed away Thursday, January 17, 2018 at South Bruce Grey Health Services, Walkerton. She was 86. Mother of Sherry (Gary Lemay) of Formosa and Dan (Brenda) of Walkerton. Grandma of Kim (Morrison) Lowe, Tracy (Gord Bester) Purves, Jason Meyer, Bill (Lisa) Meyer, and Ashley (Mat) Coleman. Great-grandma of Meghan, Connor, Kenzie, Avery, Amber, Emily, Gabriel, Carson, Lilly, Kaleb, Jaden, Macy and Anson. Elaine will be remembered by her sisters; Patricia (Joe) Ernewein of RR 3 Walkerton and Karen Allen of Strathroy, sisters-in-law Helen Meyer and Yvonne Pomeroy and will be missed by many nieces and nephews. Elaine is predeceased by her husband, Herbert Jr., daughter Sharon in infancy, sisters; Nancy (Leonard) Ellig and Joanne McNab, sisters-in-law Virginia (Nick) Giesler and Betty Lutz, brother-in-law Jim Meyer, and her parents Edward and Mary (nee Schmidt) McNab. Cremation has taken place and interment in Calvary Cemetery to be held in the spring. Donations are being accepted for: WALKERTON & DISTRICT HOSPITAL FOUNDATION. Dan and Brenda, I am so sorry to hear of the passing of your mom Dan. Sending you my deepest condolences. Dan and Brenda and family, we are so sorry for your loss. Sending our deepest sympathy to you all.